Archipelago is a strange video slot, and not one which really has a theme which is grounded in reality. Instead, this slot machine game is far more fantasy-based, and contains imagery consisting of hourglasses, coloured cubes, and altars. It’s all very magical and rather bizarre stuff from GamesOS. 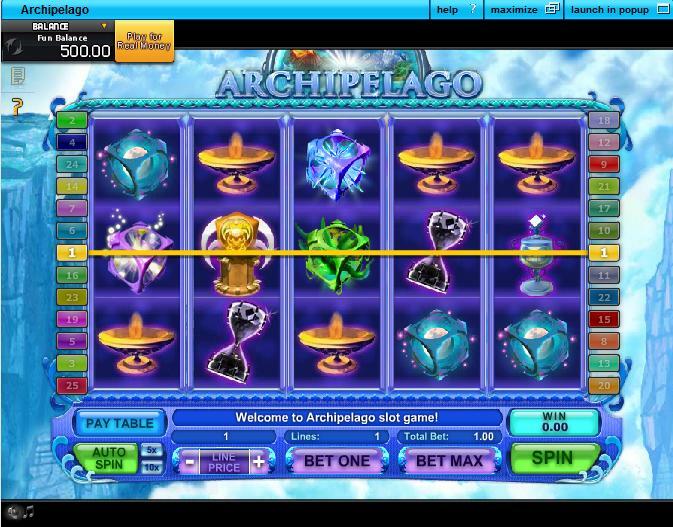 Archipelago features a basic 5-reel, and 25-line setup, with players able to adjust any of those paylines as they see fit. They can also choose line bets which range from 0.05 up to 1.00 in total. Given the number of adjustable paylines present in this slot machine, expect to be wagering anything from 0.05 per line per spin, up to 125.00 per spin in those weirdly themed slot. Top prizes are capped at 2,500 coins in all, if you land the golden pedestal icons 5 times on any active payline. 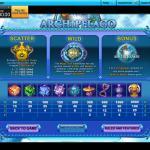 GamesOS’ Archipelago slot machine isn’t that original when it comes to its features. 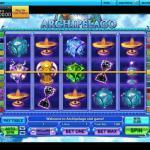 We’ve seen these kinds of features before in other slots from this casino software developer. Players can expect to be able to find wild symbols which can substitute for all other symbols barring bonus and scatter icons. They appear as magic dishes and can expand into Mega Wild symbols when they appear on the central, third reel. Scatter icons appear as golden cups, and when 3 or more of these symbols appear on the reels, players can pocket a total of 5, 10, or 15 free spins. There is nothing inherently special or unique about the bonus round in this slot, so it should be simple for new players to grasp without any troubles whatsoever. 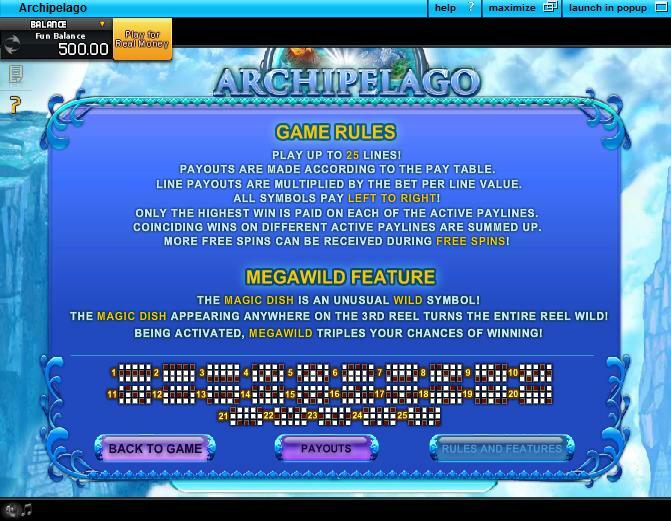 There is, however, another bonus feature included in the Archipelago slot machine game. 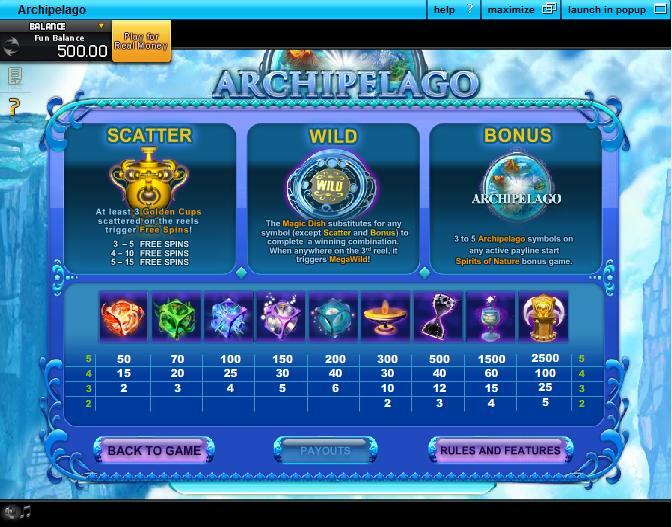 As for the secondary bonus round, that is triggered by landing 3 to 5 of the Archipelago symbols on any active payline. It is no good landing them on random reels. These are not scatter icons. Players are going to need to bag them specifically on paylines. Once this has happened, players can trigger the Spirits of Nature bonus round. In this bonus round, players can choose either the Wind World, Forest World, Electric World, or Crystal World symbols to bag instant cash prizes. The prizes are awarded at random, based on the amount you have wagered per line, so there is no secret to bagging big wins in this bonus feature.